A trackball? In 2009? Indeed, Kensington is going retro with a new design that they claim is the first to "allow users to navigate and manipulate digital content through the ball itself." With all functionality now integrated into the ball, users can control all the many interface functions that support navigation, media control adjustments, document and photo browsing with the rotation of the ball. And the low profile stationary design with its ruby red ball sitting atop a sleek gunmetal gray base is visually striking, takes up minimal desk space, and enables a relaxed and comfortable user experience, without the need of a wrist pad. Is the trackball poised for a comeback in an era of touchscreens? I can see how a trackball could make handling digital content easier than a standard mouse, but there is a $130 barrier to entry when the device is released at the end of January. Kensington Announces New SlimBlade(TM) TrackBall – Now "The Ball Does It All"
To Turn Savvy Digital Lifestyle Users Into "Smooth Operators"
Redwood Shores, Calif. – January 6, 2009 – Kensington Computer Products Group, a worldwide leader in delivering smart made simple computing accessories for the mobile consumer, today announced its SlimBlade Trackball for the Mac and PC that brings a whole new level of control, comfort and ease to today's digital savvy users. Kensington's breakthrough design combines hardware and software into one integrated interface for smooth operation allowing users, for the first time ever, to navigate and manipulate digital content through the ball itself. With all functionality now integrated into the ball, users can control all the many interface functions that support navigation, media control adjustments, document and photo browsing with the rotation of the ball. And the low profile stationary design with its ruby red ball sitting atop a sleek gunmetal gray base is visually striking, takes up minimal desk space, and enables a relaxed and comfortable user experience, without the need of a wrist pad. The SlimBlade Trackball is the latest offering in Kensington's award-winning SlimBlade collection of smart and sleek computer accessories. The unique heads up display user interface shows users – right on the computer screen itself - which mode or function is enabled. This first-ever melding of hardware and software means that a user's hand never needs to leave the ball and their eyes never need to leave the computer screen. This revolutionary design allows users to focus on enjoying their digital content – not on the interface – and is especially valuable for providing instant feedback for immersive experiences. Navigation mode controls the cursor and scrolling; Media mode controls volume, play/pause, stop and next, while View mode zooms in/out and pans for accurate and efficient photo editing. Recent CEA research shows that over 70% of the applications used in the home are centered on entertainment, music and media. Trackballs have long been used in the workplace, but as digitally-savvy families are taking advantage of the broad range of Internet-based sharing and entertainment capabilities and increasing the quantity of home computing activities, early Kensington research shows that the trackball is about to become the device of choice for personal use. "Our Kensington SlimBlade Trackball is a true standout that should become a 'must have' for today's digital lifestyle-savvy consumers," said Juan Rodriguez, Senior Global Product Manager, Kensington. 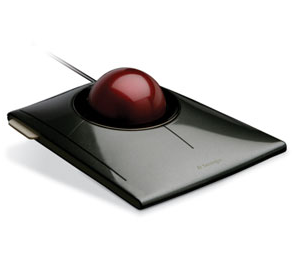 "We have been known for our trackball leadership for 25 years, so it is only natural that we would be the ones to accomplish this breakthrough user interface, where 'now, the ball does it all'. And it fits perfectly into our award-winning smart made simple SlimBlade Collection. This product is going to set a new standard for the computer/user relationship from the moment it comes to market." The Kensington SlimBlade Trackball is now available for pre-order at Amazon.com and Kensington.com and will be available at major retailers at the end of the month. For additional information on the new and existing line of Kensington products, please visit www.kensington.com.